The Pass is often referred to as Heavens Gate, as its picturesque landscapes and magnificence resemble a gate to the Heaven. When reaching the end of Tram Ton Pass, you will be finally at the peak of Hoang Lien Son Mountain, which is called Heaven Gate. 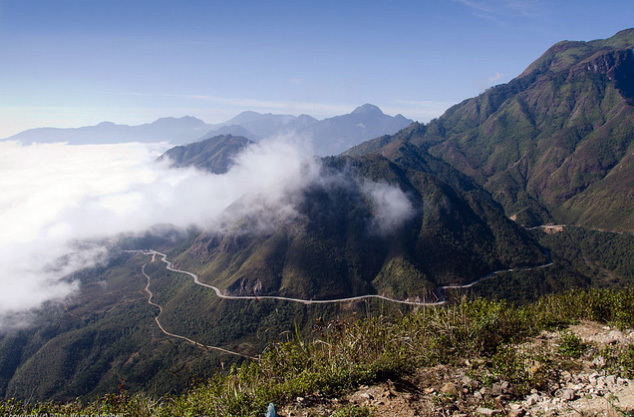 It is where you come to understand why Sapa is a must visit place in Vietnam after seeing the massive landscapes covered by the lush foliage and terraced rice paddy fields. What’s more, if you are there on a clear day, you can even see the shining and stunning Thac Bac Waterfall while standing at Heaven Gate. Moreover, Heaven Gate is where you can truly see and feel the majestic grandeur of Mountain Fansipan, which can be a great motivation for you to conquer this high and mighty mountain. One special thing about Tram Ton Pass is how drastic climate change can be. On Sapa side, the weather is cold, foggy and occasionally drizzly. On the other hand, on Lai Chau side, it is getting warmer and you can see the shining blue sky over there. It is not a common experience that you can have in other places in Vietnam.